TRIVIA of Noh : Q63 : Are koutai a way to understand Noh more quickly? | Home | Trivia | Q63 : Are koutai a way to understand Noh more quickly? Are koutai a way to understand Noh more quickly? In the Edo era, common people had few chances to enjoy Noh, but when publishing became more commonplace and chant books more common, the utai spread throughout Japan. After time, portions of utai began being sung and listened to, becoming koutai, or “small utai,” and establishing themselves as a part of popular culture. Koutai last between one and three minutes, and are indicated in chant books of the entire original play. During the Edo era, compilations of koutai, koutaibon, also became popular. 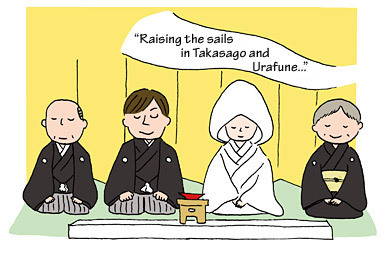 For example, the famous Takasago in the “Raising the sails in Takasago and Urafune,” is one of five places koutai are used in the congratulatory lyrics often heard at weddings. In addition to congratulatory and felicitous koutai such as Takasago used in weddings and Tsurukame and Kantan used in building dedications, koutai such as Tōru and Ama are used in legal proceedings. There are koutai for flower viewing (Sakuragawa and Kuramatengu) and other parties (Momijigari and Ōeyama), which are collectively known as sakanautai, or “side dish utai.” We see from these traditions just how much Noh has come to be enjoyed in the lives of everyday people. If utai seem difficult and unapproachable, starting with koutai may be one good approach. You will be able to feel the essence of utai from just a few lyrics, and may feel closer to Noh as well.